Thinning hair and male pattern baldness are a disheartening fact of life for many men and I'm including myself in that statement. I've tried many courses of action over the years; I've experimented with vitamins, hair regrowth shampoo, Rogaine and Minoxidil and I've even contemplated a surgical hair restoration procedure. But, although many of these have proved effective in the short-term, they don't help me disguise the fact that I've already got bald areas on my scalp. The solution I've found and that I'm a big advocate of is using hair thickening fibers to hide the fact that my locks aren't as luscious as they once were. I've worked my way through a few different hair loss concealers. All of them have pros and cons; in this article I'll talk you through how three of them work. After trying out several other products, I have to say this is the one I've personally settled on. You can read my story here. It's not that the results are necessarily better with Toppik than they are with the other two products featured, but they are just as good and it's the most affordable solution. Toppik hair building fibers are sprinkled on to your thinning areas and add a layer of 'hair' to your existing hair. The keratin in the fibers (which is also found in natural hair) means that they latch onto your healthy follicles and give the instant appearance of thicker, fuller hair. It's certainly the most affordable of the hair loss concealers I've got experience of and it's equally as effective. It comes in a range of 9 shades to suit your genetic colour. It has given me a real confidence boost - I no longer feel paranoid about my male pattern baldness as I know it is disguised convincingly. The fibers stay in place easily with a little spritz of hairspray. It is recommended by doctors as a safe alternative to medication, but can also be used in conjuction with hair transplants, taking Propecia or the regular application of Minoxidil. Toppik hair building fibers stay in place until you thoroughly shampoo your hair. They won't cause a mess and are easy to apply. Comes in different sizes to suit your needs: Travel, Regular, Economy and Giant. The only real disadvantage with Toppik is that, as with all products that require you to sprinkle the substance onto the scalp, there is some wastage. My tip would be to invest in either the Economy or Giant size as they last longer and you get more for your money. It's really easy to use Toppik as a bald spot cover-up or to thicken up thinning areas to give them a fuller appearance. Sprinkle it lightly onto the affected areas. You will notice an immediate change in appearance as the hair fibers bond to your own hair. Because they are strongly 'magnetized' with static they'll stay secure until the next time you wash with shampoo. How Much Does Toppik Cost? Selected Amazon Review: "This is really a great product as it fills in those areas where I'm losing hair...mainly on top of my head. I share my "discovery" with anyone that I meet that has the same thinning that I have". Organin is a natural substance that eradicates the appearance of thinning hair on your scalp. Much like Toppik, the finely textured fibers, which are produced using natural plant extracts, cling to the existing follicles and build a new blanket of what looks like hair giving a fuller and thicker look. A convincing and easy-to-use bald spot cover up. It's not a messy cream or paint. The clean and convenient fibers won't stain any surfaces or clothing and there will be no smearing of the substance on your skin. It's very easy to apply - you simply sprinkle it on the problem areas and the results are instant. The appearance of thicker hair will last until you wash Organin out. There are 8 tones of Organin to choose from. You can also mix and match shades so you can get a really authentic match to your natural colour. Available shades are: Black, Dark Brown, Med Brown, Lt Brown, Brown, Ash Blonde, Dark Blonde, Lt Gray. Because it is made completely from non-toxic ingredients, Organin is clinically proven to be safe and gentle on your skin and hair. Organin is affordable - it's a low-cost alternative to over-priced hair regrowth products such as Minoxidil or Propecia. With any fibers that you sprinkle there will always be a bit of wastage as not all of them cling instantly to your hair. Before using Organin, wash your hair as normal, dry it and comb it into your preferred style. Shake the fibers onto the balding areas until the skin on the scalp is covered, then pat the areas that you've applied Organin softly to allow the substance to settle. For best results, use a hairspray to keep the fibers in place. Simple as that. How Much Does Organin Cost? The great thing about this slightly more expensive hair loss concealer is that, unlike some of the others, it is completely water and moisture proof, which means you can shower, swim and sweat. It is similar to Organin in that it uses organic ingredients which makes it a really gentle and safe option for men and women with thinning hair. Organic microfibers are sprayed onto the scalp and produce the appearance of a thick, luscious head of hair which looks very natural. The fact that this is one of the only fiber-sprays available mean that it is even easier and more convenient to use than the the other products. The spray concentrates the flow of the fibers meaning there is no chance of spillage or mess (with the sprinkling method used by Organin and Toppik, there is inevitable a bit of waste). It's available in eleven shades so you can achieve a perfect match: Black, Blonde, Auburn, Grey, Silver, Dark Brown, Medium Brown, Light Brown, Hazel, Ash Blonde and Light Blonde. Organic and clinically tested ingredients make it gentle of the skin of the scalp. The manufacturers guarantee that the product does not in any way increase the chance of more hair falling out - it won't harm your existing follicles. The water-proof feature means the fibers will only leave your hair when you wash it thoroughly. 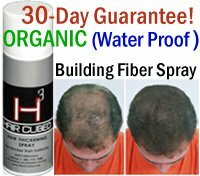 Hair Cubed Spray is completely compatible with other medications to treat thinning such as Rogaine foam. Hair Cubed Spray isn't cheap. In fact it's one of the more expensive products I've tried to address this problem; to get the best results, you'll also need to invest in the Hair Cubed ionic brush and the Sealer and Control Hair Spray. But, like the old saying goes, you get what you pay for. A quality product that will give a thicker appearance and a thoroughly convincing look. Shampoo as normal and dry your hair thoroughly. It's imperative that it is completely dry and clean. Comb through and select the bald or thinning spots where you wish to apply the fibers. Shake the can of Hair Cubed Microfiber Hair Thickener vigorously, then hold the nozzle 4 inches away from the scalp area and spray it on. To achieve the most natural look, brush the fibers through with an ionic brush; the more you brush the thicker and fuller the appearance will be. Apply a setting hairspray to hold the hair thickening fibers in place. Wait for around a minute for the spray to dry and style as normal with any of your favorite products. How Much Does Hair Cubed Spray Cost? Selected Amazon Review: "This Is by far the best spray I have tried - by far! In fact, I think I have tried them all".